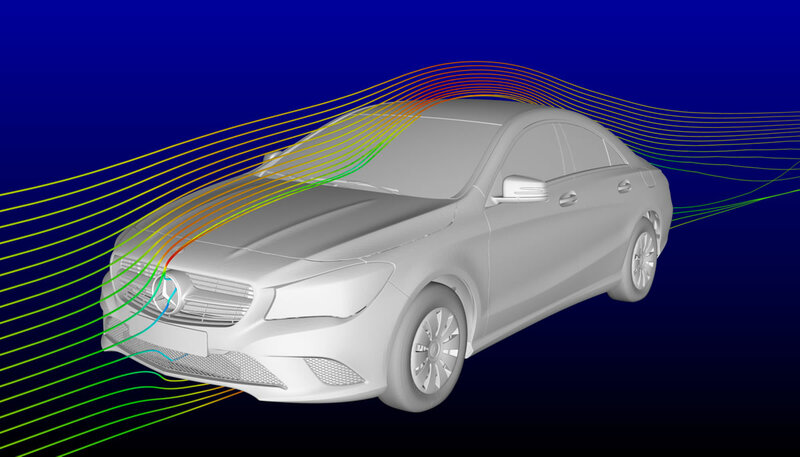 For the last few years, Mercedes-Benz has lead the way in vehicle aerodynamics, whether it be minimizing wind resistance, reducing noise levels, increasing open-top driving comfort and anti-soiling measures, the models from Mercedes-Benz are without question aerodynamically superior to their competition. 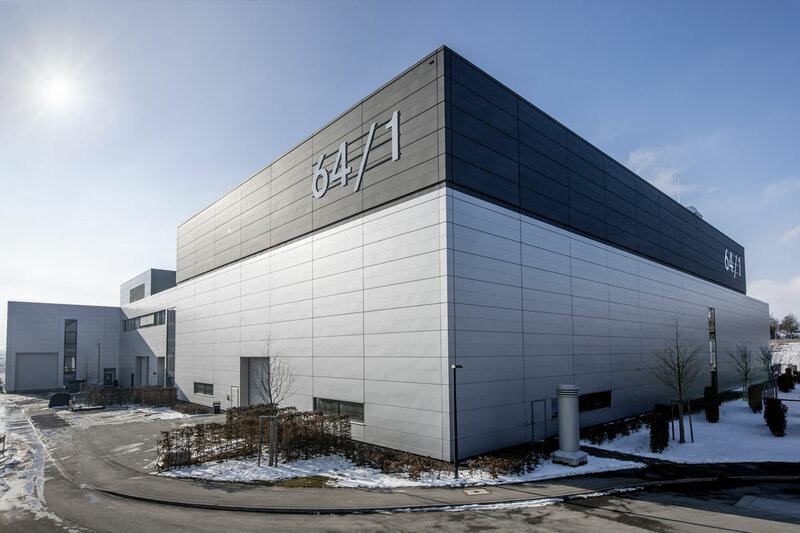 Mercedes previously relied on the University of Stuttgart and its original wind tunnerl, but now with the new aeroacoustics wind tunnel at the development center in Sindelfingen, the company is also taking the lead in aerodynamic testing. Before reading on, in order to enjoy this series of articles, here’s a quick overview of what a Cd figure is and how Mercedes-Benz stacks up against others. 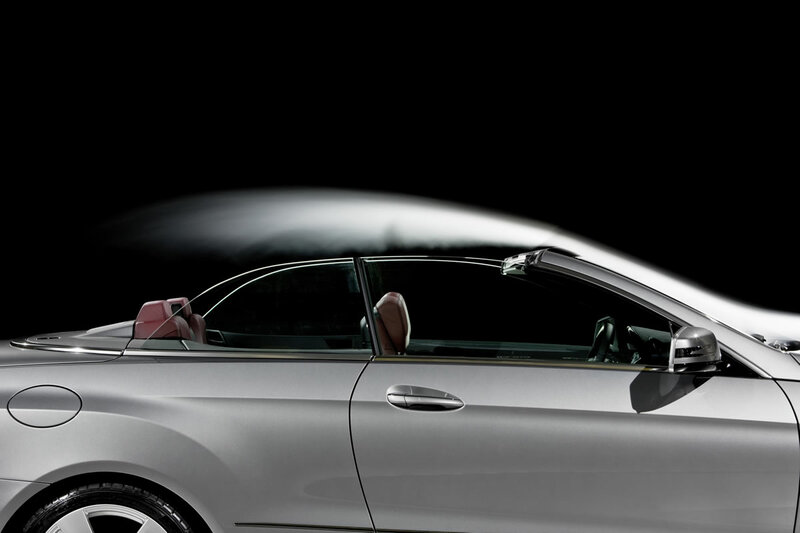 The Cd figure is the measure of the aerodynamic efficiency of a solid body, in this case, a car. 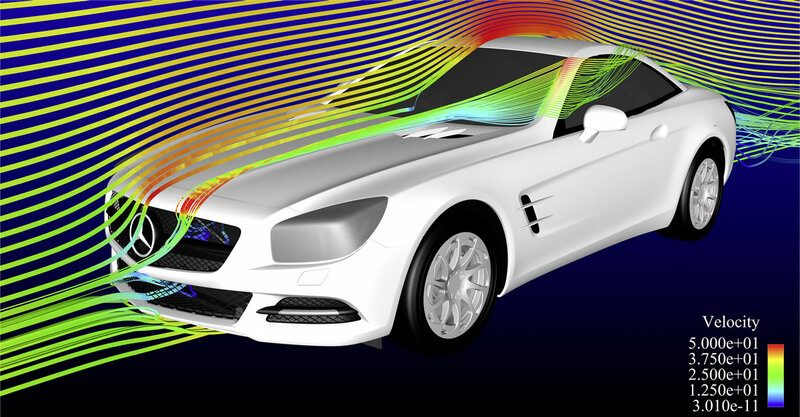 When a car’s speed increases, wind resistance becomes an increasing factor, adding to the total resistance against the car. 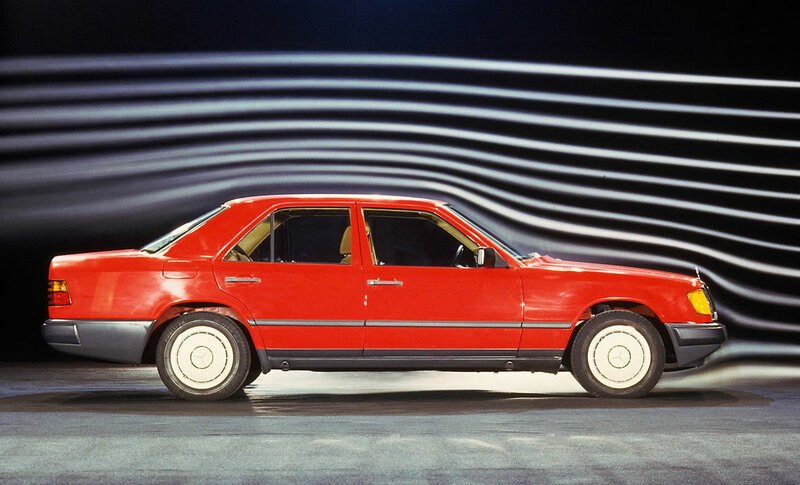 In direct terms, if the Cd figure can be reduced by ten thousandths, fuel consumption falls on average by one tenth of a litre. The Mercedes-Benz CLA has the lowest of all Cd figures of all at 0.23 – both within the Mercedes-Benz model portfolio and amongst all series production cars. 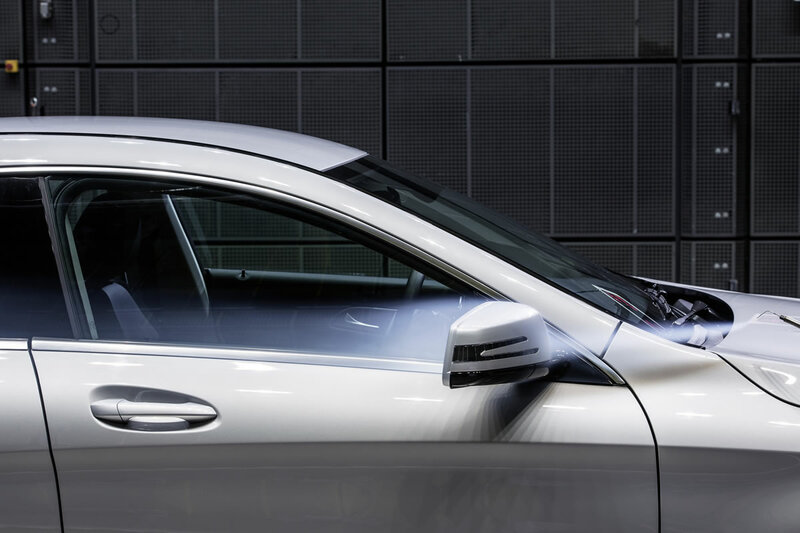 The CLA 180 BlueEFFICIENCY Edition even betters this benchmark with a Cd figure of 0.22. 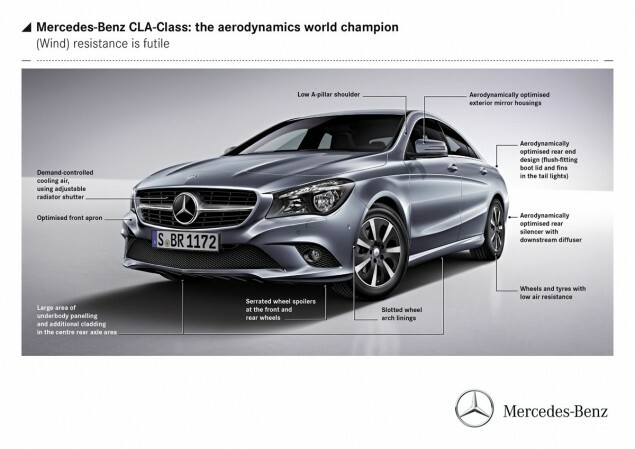 Compare this to the the Toyota Prius which is rated at 0.25 Cd and the BMW 320d at 0.26 Cd and you see why the CLA’s numbers are so impressive. 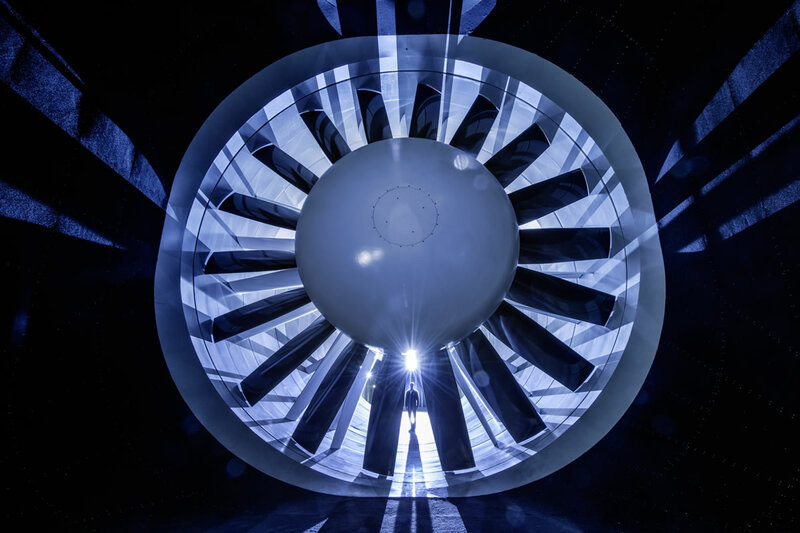 “Highly sophisticated improvements to both the overall vehicle and detailed features contribute to this good performance,” says Dr. Teddy Woll, Head of aerodynamics/wind tunnels. 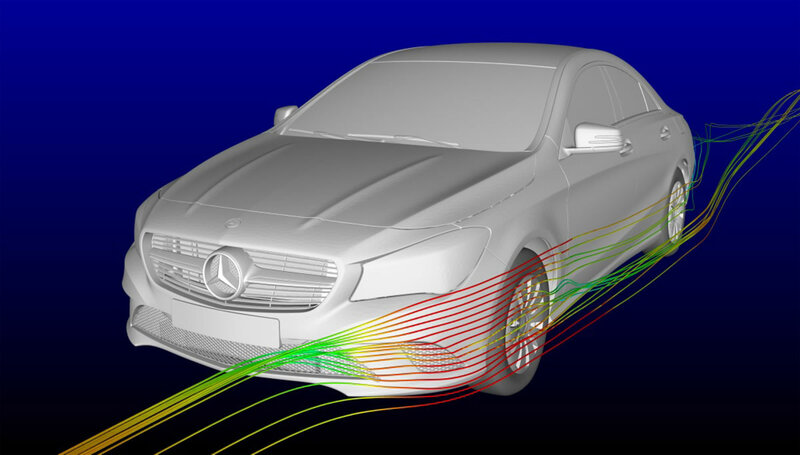 Emotion meets efficiency: the more aerodynamically efficient a vehicle is, the lower its fuel consumption. 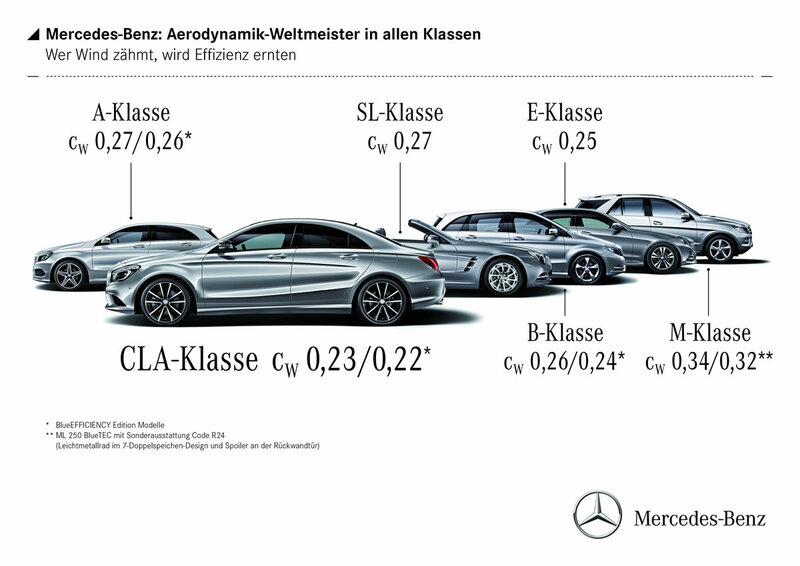 Woll: “In the New European Driving Cycle (NEDC), improving the Cd figure by 0.01 already lowers CO2 emissions per km by one gram, by two grams as a function of mean on-the-road consumption, and at 150 km/h by no less than five grams of CO2 per kilometre.” Moreover, safety, comfort and the environment also benefit from the elimination of air turbulence. 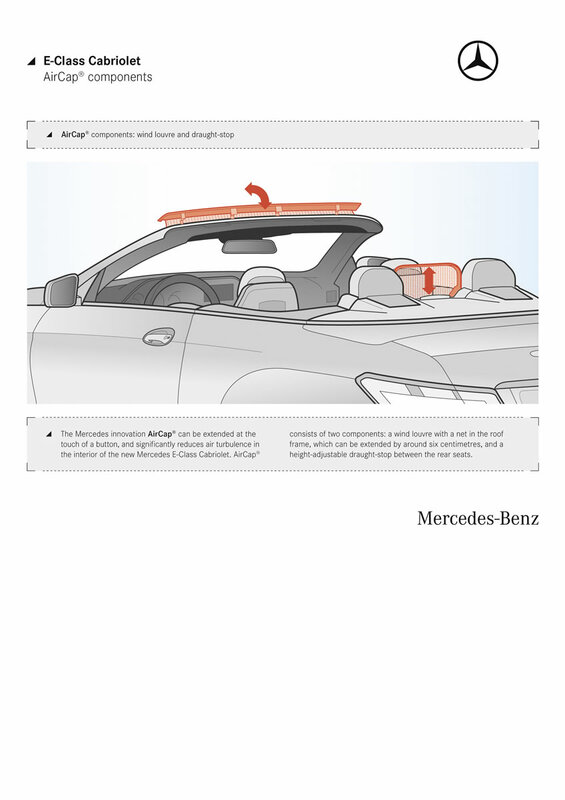 Because low levels of lift ensure good roadholding, while low wind noise is welcome to both passengers and pedestrians. 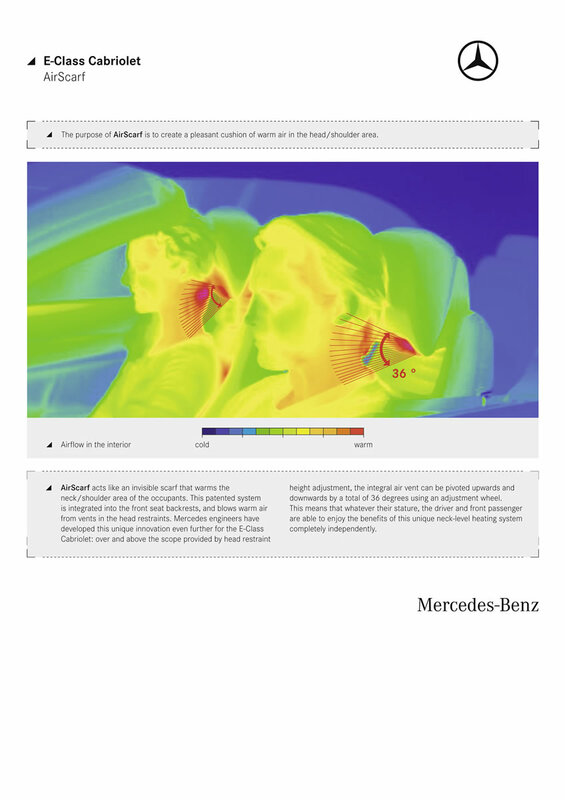 Models from Mercedes-Benz also take the lead in almost all segments when it comes to aeroacoustics. The new CLA will have the lowest level of wind noise in its segment. 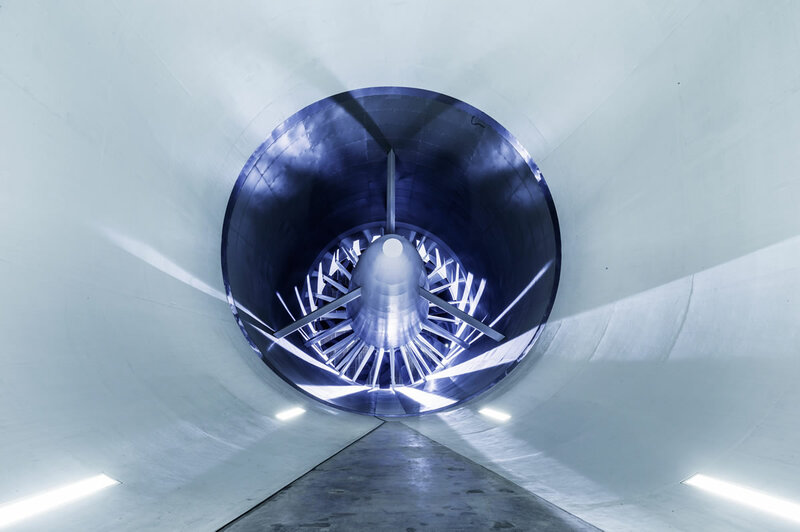 The blower of the new aeroacoustics wind tunnel has a diameter of nine metres and has 18 vanes that set the air in motion. The maximum wind speed is 265 km/h. 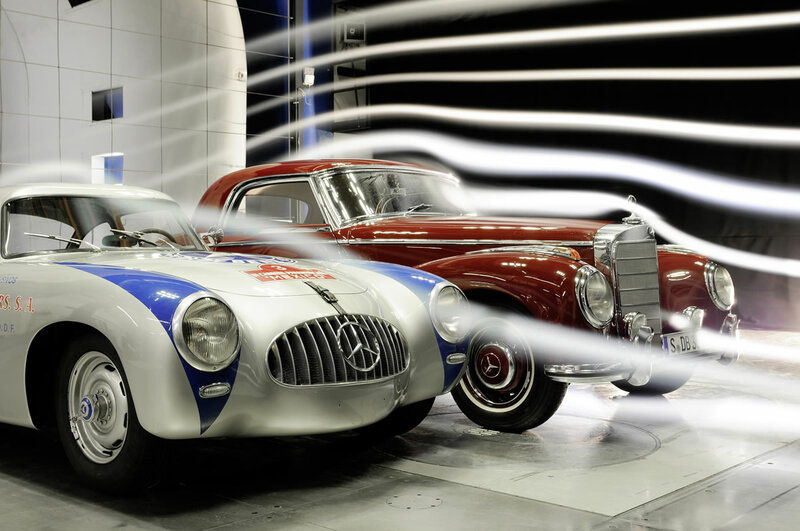 With the “large wind tunnel” in Stuttgart-Untertürkheim, Mercedes-Benz was the first automobile manufacturer to possess a wind tunnel – the first documented measurement was carried out there exactly 70 years ago, on 5 February 1943. 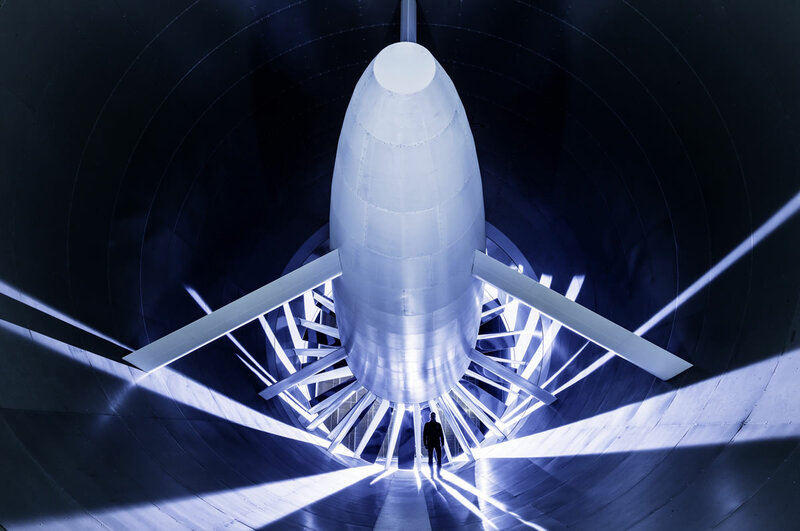 With the new aeroacoustic wind tunnel at the development centre in Sindelfingen, the company has once again placed itself at the forefront of aerodynamic testing. 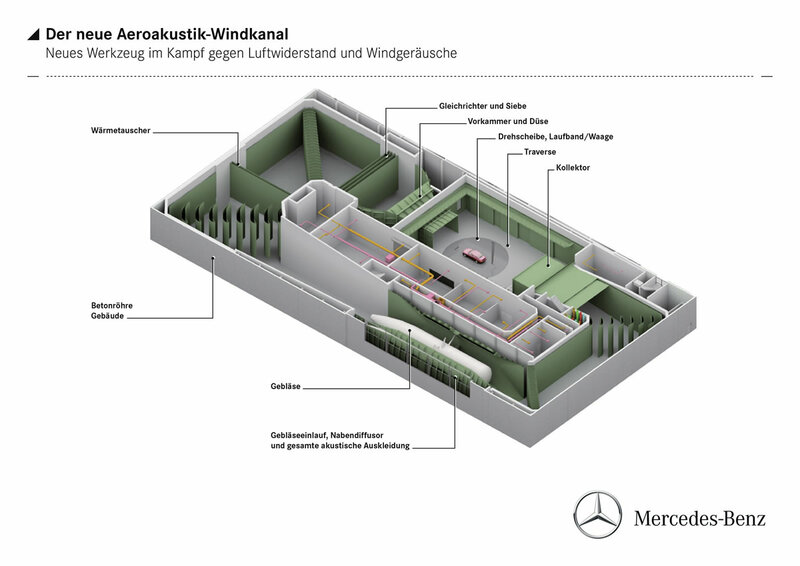 The new wind tunnel, which will be taken into operation in mid-2013, follows the Göttingen design. 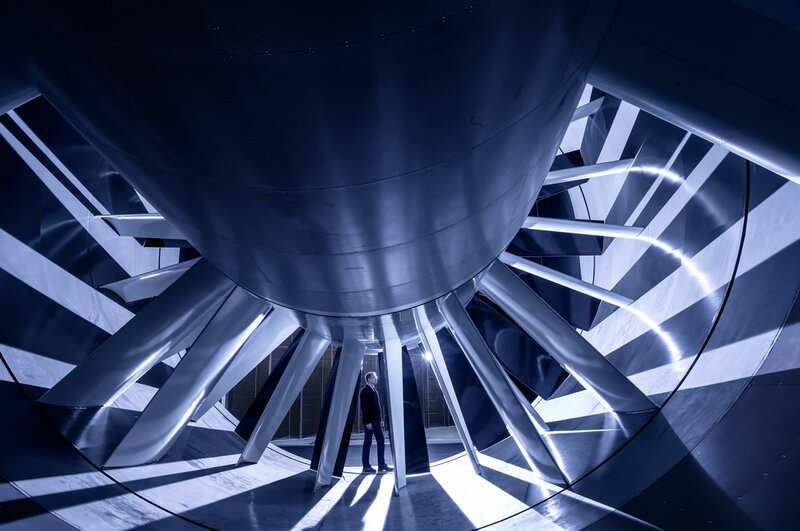 This means that after the measuring stretch the air is directed back to the blower and again accelerated to up to 265 km/h. 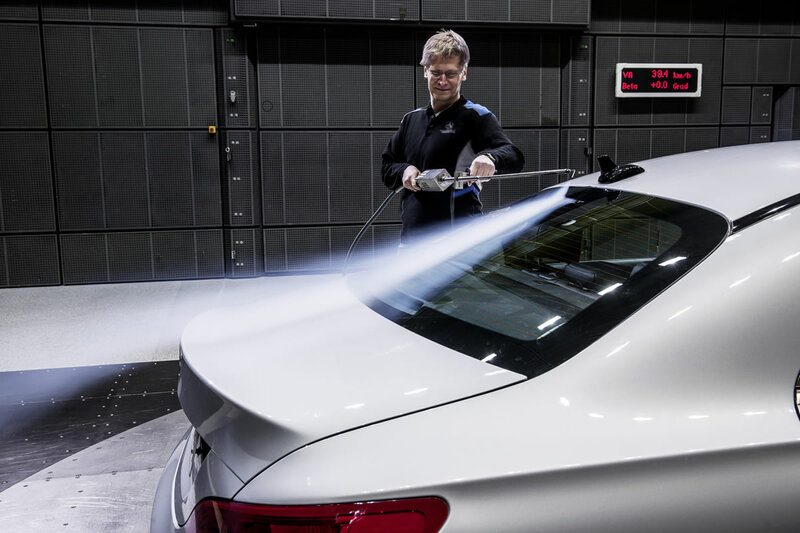 Before the air accelerated by the blower reaches the measuring stretch via a nozzle system covering 28 sq. 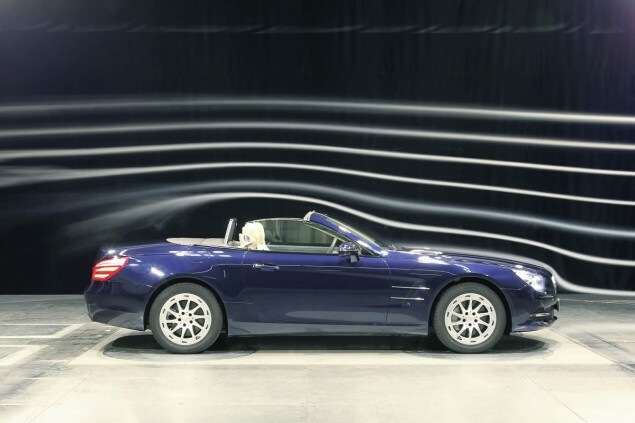 m., it must be directed and smoothed to eliminate unwanted turbulence and eddies. 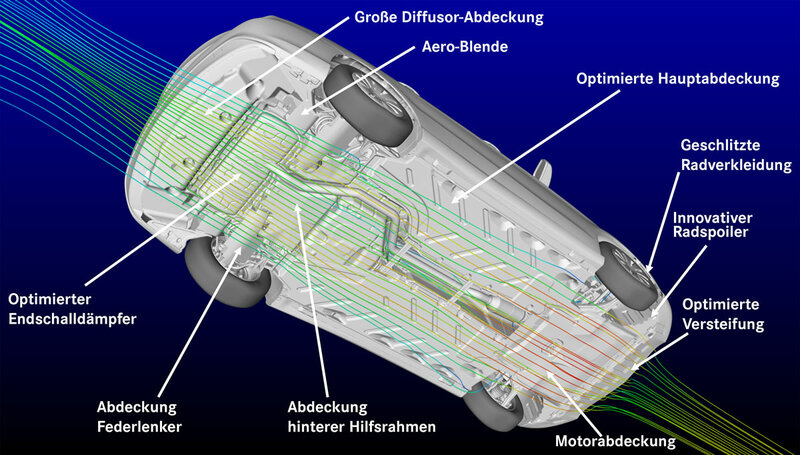 This done using rectifiers and sieves. Extensive noise insulation measures are integrated to allow use as an acoustic tunnel where interior and exterior wind noise can be measured for the relevant test vehicle. 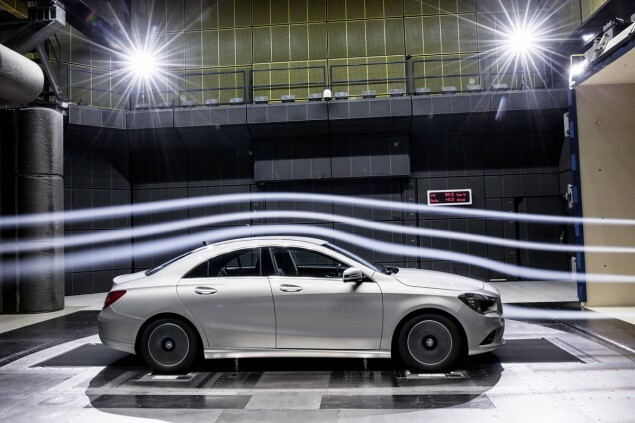 Even at 140 km/h the air flowing through the measuring stretch is therefore as quiet as a whisper. 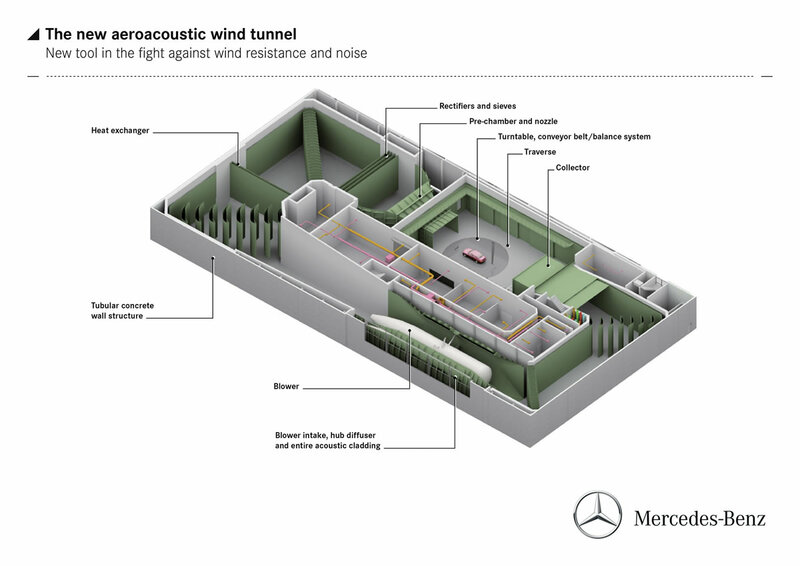 The centrepiece of the 19-metre long measuring stretch in the wind tunnel is the roughly 90-tonne conveyor belt/balance system with a turntable. 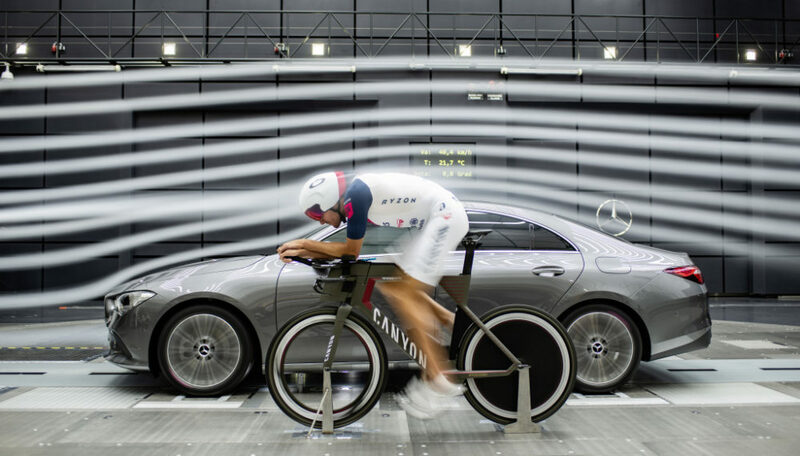 The new wind tunnel has a 5-belt system to simulate the road. 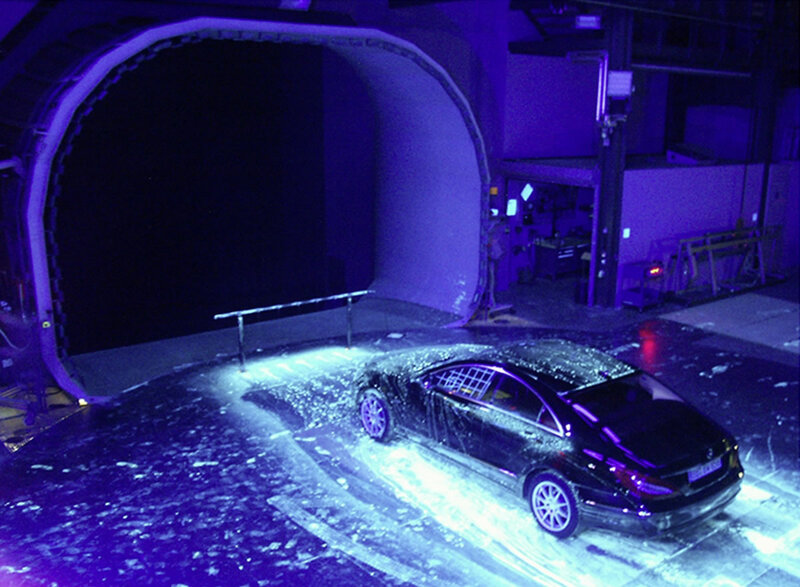 The conveyor belt/balance system is integrated into a turntable with a diameter of twelve metres. 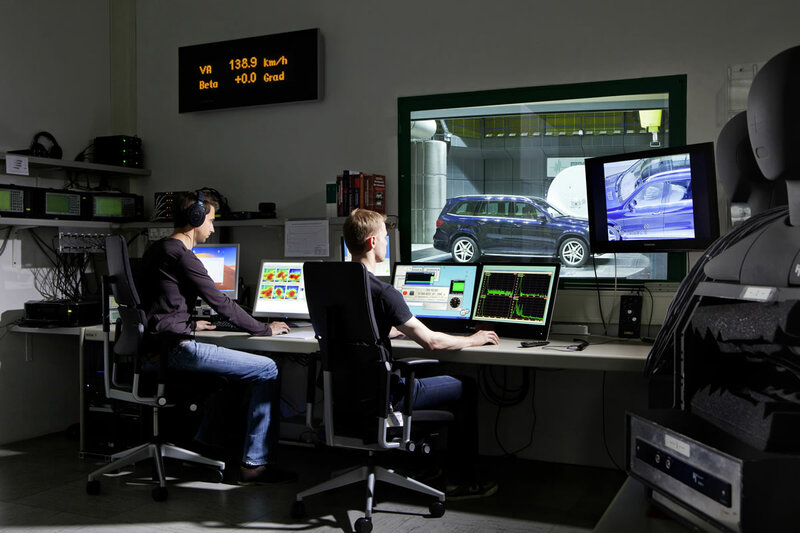 This means that the vehicles to be measured can also be subjected to an angled airstream to simulate cross-winds. 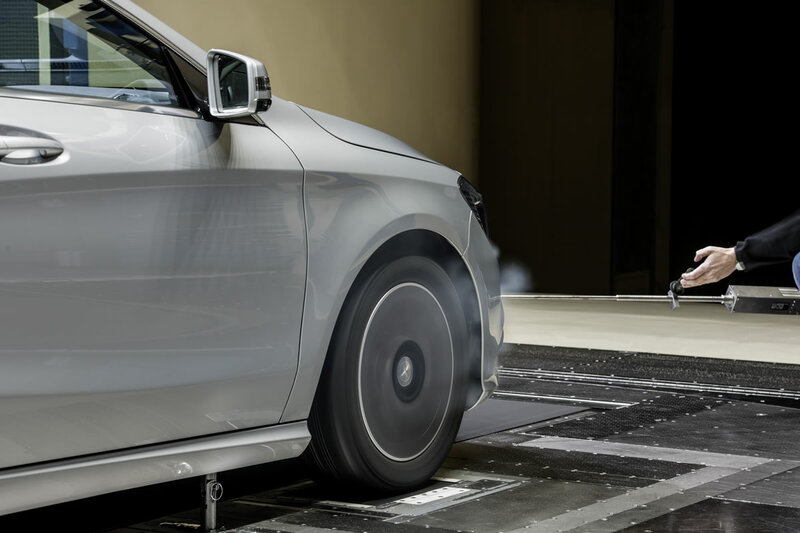 The traversing system enables the engineers to position various aerodynamic sensors and microphones around the test vehicle with very high precision. 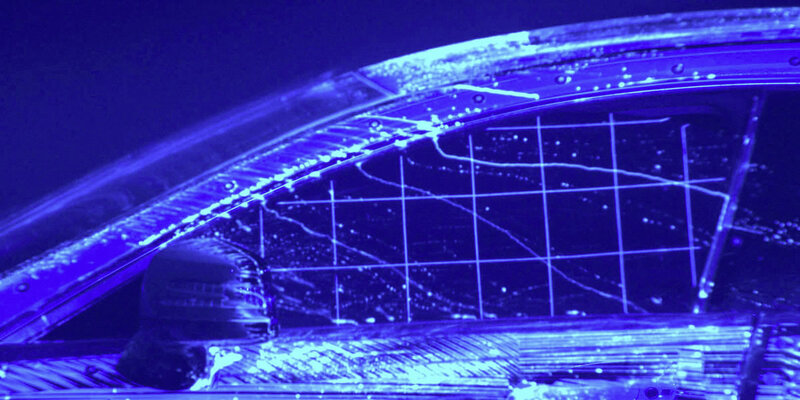 In the wind tunnel, aerodynamics specialists optimise the components with the help of fluorescent liquids to make soiling visible. 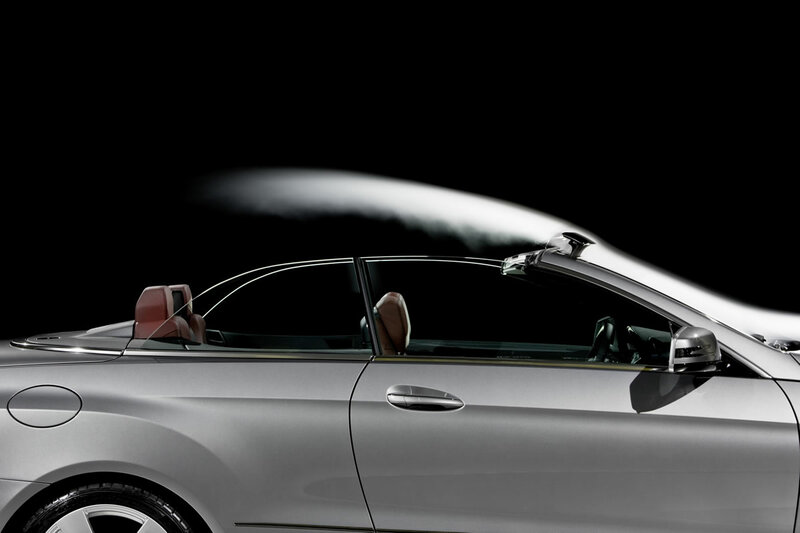 The objective is to conduct the water in such a manner that the side windows and the exterior mirrors remain unsoiled. 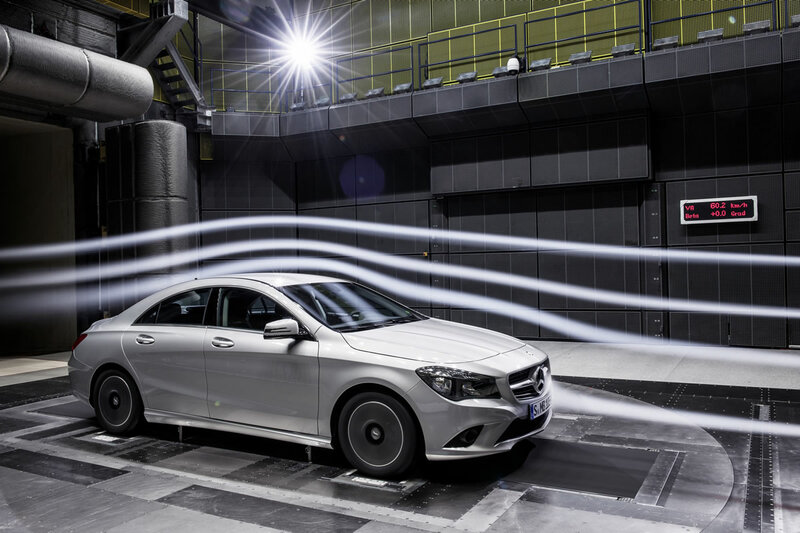 Every component of the new CLA-Class will have been improved by undergoing several control loops with the help of airflow simulations before it is allowed to prove its aerodynamic properties with measurements in the wind tunnel.